Honestly now: Do you use your phone while driving? 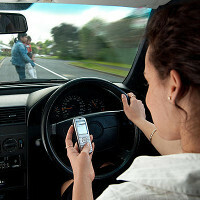 When it comes to hard data on distracted driving, it's not difficult to draw a conclusion. Many studies show that playing with your phone while behind the wheel increases the odds of an accident occurring, and so most countries the world over have enacted laws making the usage of mobiles illegal when driving. Of course, actually catching people in the act often enough for the point to get across is pretty hard. So, many of us do it anyway. Despite knowing — even having experienced the effects firsthand — that checking out that last notification puts us at danger, we still reach for our pockets. And depending on what we do from that point on, that danger can be either relatively small, or quite serious, with research indicating that texting is among the most distracting activities, followed by reading messages from others. Yet, we do it. I don't drive, I ride a bike. But when need to use my phone I pull off to the side and stop. Because I'm not an idiot. Useless? Where I live cyclists are subject to the same laws and regulations as motor vehicle drivers, even though I have no license (not because it was revoked, I just never learned to drive) I obey the laws, use hand signals, know the Rules of the Road, I even know how a 4-way stop works, while 75% of motorists are completely baffled by the situation. Above all, I don't endanger myself or others by texting while mobile. I do glance at my .mp3 player while changing songs though. Because why the hell did I put THAT song on my playlist, or that song or that song? Winger? Great White? What the hell was I thinking? 75%??? source please? wait, so you DO glance at your device(mp3 player) while riding? You do understand how hypocritical you came out to be, no? Useless comment aaaand Reply! You're not an idiot, but you never learned to drive? Then you might get hit by idiot driving. I'm in the Waze/Android Auto user category. This poll is somewhat flawed, as it does not differentiate between those who are using the phone "hands-free" or not. Yes, I realize that hands-free is still on the distracted driving scale, but using Google Maps is quite apart from typing a message directly. Never Because I Hate Driving So I Don't Drive LOL. I drive every day but I don't use the phone while doing it. It's for my safety and also for the other people around me. Stop being idiots. Pull over, get your job done and then continue. Don't put others in danger. Exactly. I only use it at stop lights to change a song on Spotify, never to text. Everyone farts (including those who think their sh1t doesn't stink), everyone picks their nose, everyone masturbates (age permitting), everyone pisses in the shower. Everyone has used their phone while driving. EVERYONE. Not Me So You Are Wrong. I should have made the disclaimer that not everyone has driven or had a license. I Am Wrong And Extend My Apologies. Admitting To Being Wrong, A Quality So Many Lack, Kudos For Being A Stand Up Person. LOL Your Profile Pic Tho. I honestly hope than one day while giving a ride to your family /friends you crash and ur the only survivor. Then u might realise that a stupid call/text can wait 10min/1h/whatever. I never, ever touched my phone while driving, and if I notice someone is insisting I pull over In a safe place. I don't piss in the shower (anymore), sometimes you will see it slightly and it is hard to cleanup :p. "Everyone farts (including those who think their sh1t doesn't stink)" If ppl think their shi1t does not stink, why would they not be farting? Wouldn't this ppl be the first to fart? Not everyone is nasty, sorry. Never. I don't have a driving licence. Never.. I attend calls via BT system of car only, hands on steering wheels always..
Am I the only one imagining Vin Diesel narrating your comment? "When I ride; I forget who I am, What I'm going to do or what I've done... When I ride, I live the moment!" I have a bluetooth hands-free kit, but still i don't make calls while i am driving. Whenever i hang up, i wonder myself, how i already got so far. It is like a blackout. I just can't remember anything from the start of the call to the end. It is weird. It seems like i can drive safely, while not beeing focused, but it still scares me, that i can't remember anything, so i just don't do it. my phone is connected to my car via Bluetooth, and is stuck on the dash using a magnetic mount. I have a dedicated car launcher (Car Dashdroid) that I'll use to launch Waze and music before I start my trip, and if all goes smoothly, I don't touch either of them, and can change tracks using the steering wheel controls on my car. Anything I do on my phone while driving is equivalent to adjusting the radio. I absolutely do not text, browse the internet, take photos, etc. while behind the wheel.